Cirrius Solutions offers a robust team of seasoned business analysts, solution architects, development experts and QA professionals. Our combined 250+ years of experience will ensure that we maximize the CRM capabilities you expect from Salesforce and introduce you to the multitude of lesser-known benefits. We will provide you with everything you need in order to grow revenue, boost productivity, and increase visibility. We employ only the best and most seasoned implementation experts. That’s why ALL 66 of our customer satisfaction scores are 5 out of 5 stars. l implementation is critical. You’ve spent years developing systems and processes that fit your needs and we acknowledge this investment of time. Our industry-leading experts will ensure a seamless integration with your legacy systems while tailoring the platform to meet your organization’s needs. 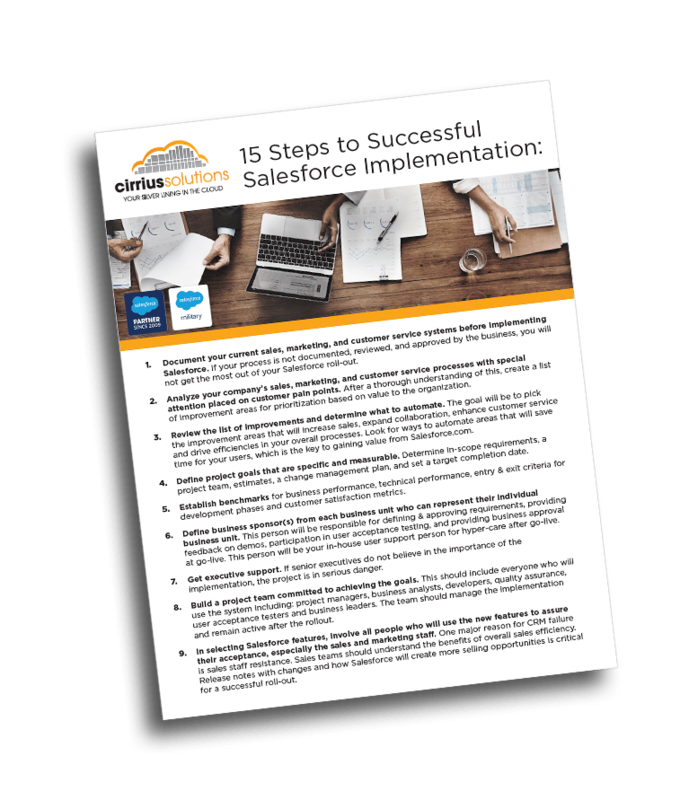 It is our job to help you get the most out of the Salesforce Sales Cloud. We will ensure that Salesforce is properly implemented and that your users have the right training to maximize your Salesforce investment. Our consultants understand that there is natural resistance to change, therefore, we will help your users see the benefits. No job is too big. Our team has implemented projects with over 5,000 users on a global scale. We will guide you in rolling out your new systems to branches throughout the world. The Cirrius team will help maximize the time your reps spend selling with productivity and collaboration tools that work anywhere, on any device. 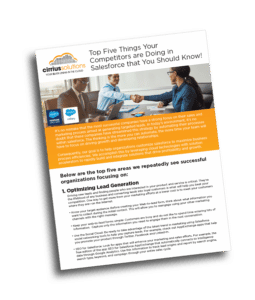 Improve the sales cycle with streamlined communication, automated workflows, structured processes and decision making tools that will ensure sales reps are focused on the most critical clients and prospects. The Cirrius team will create an organized view of your customer interactions for Leads, Accounts, Key Contacts, Opportunities and Quotes in one simple interface. 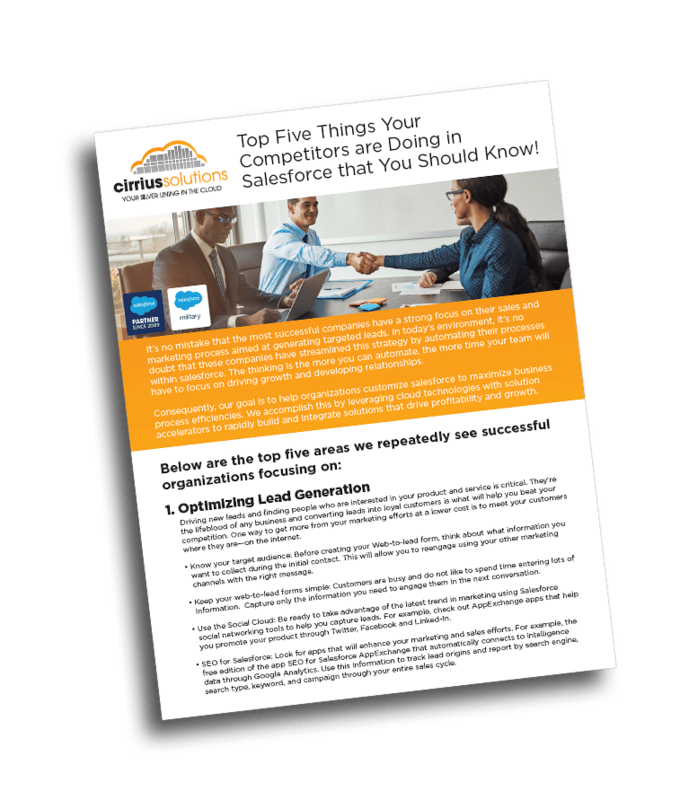 We will teach your sales team how to obtain critical insights from customer communications and popular social media sites such as Facebook, Twitter, LinkedIn, and YouTube right from Salesforce. We will hope you setup Salesforce to increase collaboration and decision-making. Salesforce decision making tools encourage and enable collaboration on sales opportunities, allow you to capture organizational knowledge in a single location, and drive progress from anywhere. We will help you track team performance with dashboards and other sales reporting tools so you can make real-time changes to reports.